Do your mornings often feel chaotic? Like you’re running as soon as your feet hit the floor and can’t seem to catch a moment of peace before noon hits? Mornings don’t have to be that way! In fact, they can actually be the most beautiful and peaceful time of day if you set yourself up to make them that way. I used to be a total night owl by nature and absolutely loathed the mornings. I truly thought I would never be able to enjoy the first part of the day or actually look forward to my mornings. 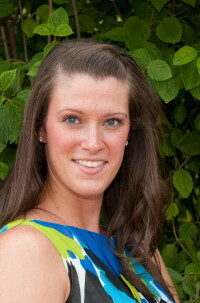 Last year I took an awesome course called Makeover Your Mornings and it completely changed the way I start my days. Instead of begrudgingly rolling out of bed and beginning my morning feeling like I’m already in a bad mood and behind for the day, I now wake up feeling eager to start my day and ready to tackle anything that comes my way. Several of you have shared your desire to become morning people too and today I wanted to share some of the strategies that I find to be super helpful in making your mornings less stressful so that you can start your days off on the right note too! Preparation is key when it comes to making your mornings less stressful! Spending 15-30 minutes at night preparing for the following day can make your mornings go so much more smoothly. Make your to-do list for the next day. This is a great way to start off your day knowing exactly what needs to get done so you aren’t wasting precious time trying to figure it out. Look up what the weather will be. This helps you to prepare for not only which clothes to wear the following day, but to see if you’ll need an umbrella, snow boots, etc. Pack lunches. If you or your spouse work in an office or your kids are in school, packing lunches the night before can be a great way to save yourself some time and stress in the morning. Set out keys, shoes, bags, etc. Try designating a “hub” near your front door where you keep everything like shoes, car keys, backpacks, and briefcases so they are all in sight and easy to grab as you head out the front door. This way you aren’t left scrambling and running around the house trying to find everything you need before you can leave. Tidying up your home before you head to bed every night is a great way to ensure that you start your day on the right note. What could be better than walking into a clean kitchen to make breakfast?! I think it’s one of the best feelings ever to wake up to a decently clean house and is always guaranteed to put me in a good mood to start my day. After all, who likes to walk into a kitchen filled with dirty pots and pans from the night before and step on toys along the way? I know from experience that I can say, not me! Be sure to check out my other Helpful Habits to Keep Your Home Clean if you haven’t yet. Having a few minutes to slowly wake yourself up instead of waking up in a frenzy is a much better way to start your day. Try setting your alarm to go off at least 10 minutes before you actually need to be out of bed. Then you can stretch and enjoy the process of waking up a bit more instead of being jolted out of bed by worrying that you’re going to be late! 4. Don’t hit snooze – at all! Speaking of alarms….have you ever once been glad you hit your snooze button? I have done this so many times and always regret it! I typically feel less well-rested than I did when my alarm initially went off, and then on top of feeling groggy I’m usually now running behind schedule as well. Do yourself a favor and don’t give yourself permission to hit snooze. Once it becomes a habit to not hit that button, it will only become easier and easier to get yourself out of bed as soon as your alarm goes off the first time. I’ve been really into practicing positive affirmations lately. It sounds so dorky and cliche, but I find that they truly do have the power to alter my attitude for the better! If you use your cell phone as an alarm clock, it can be so tempting to want to check all of your emails, texts, and social media channels immediately upon waking up. I challenge you to resist checking your phone until you’ve at least had breakfast and gotten ready for the day. When you start your day off by reading emails or checking social media, you are giving others the power to possibly dictate your mood for the day and putting yourself into a reactive state of mind instead of being proactive. Don’t give others the control to determine how you’re mentally starting your day, and instead try doing your daily positive affirmation first so that by the time you do check your emails and social media, you are already in a great state of mind and less likely to be negatively influenced by your interactions with others. When you create your to-do list the night before (as mentioned above), make sure that you’re realistic in what you are actually going to be able to get done that day. 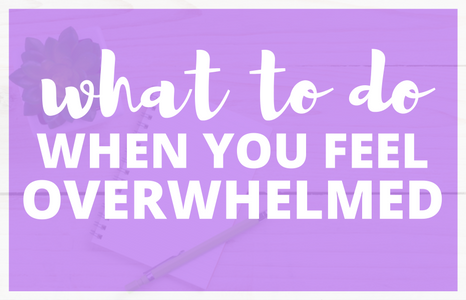 There’s nothing more discouraging than waking up, taking a look at your to-do list, and feeling like you’re already way behind for the day because you set out to get an insane amount of things done. Don’t do that to yourself! It’s okay to be ambitious and strive to have a productive day, but don’t be so focused on productivity that you set yourself up to feel like a failure at the end of every day because you weren’t realistic when you set your expectations for yourself. I know that I don’t have to stress the importance of eating breakfast to you, as we’ve all heard how it’s the most important meal of the day. But what I do want to stress is that you should actually be sitting down at your kitchen table to eat it. Even taking just 5 minutes to sit down and savor your first meal of the day is a great way to start your day off on a less rushed note. And breakfast doesn’t have to be a fancy frittata or even be different every day. Heck, 90% of the time my breakfast is a slice of whole wheat toast with peanut butter and a banana! Monotonous and a bit boring? Perhaps. But keeping breakfast simple and taking some of the decision making out of my morning helps to ensure that I actually eat breakfast and have time to enjoy it too. Your challenge – if you aren’t already a breakfast eater, try eating breakfast 5 days in a row and see how it affects the rest of your day. Do you have more energy? Do you feel better as you start your day? Take note! When I have one of those mornings, I usually put on the “Today’s Country Radio” station on Pandora and we all jam out to some country music while we wake up for the day. It instantly puts me in a more cheerful and energetic mood! If you are having a tough time waking up in a good mood, try listening to your favorite music first thing to get you pumped up and ready to enjoy your day. While it’s a wonderful thing to do your best to set yourself up to have an awesome morning, we all know that life can sometimes get in the way of our best intentions. You spill coffee on your shirt. The kids somehow find nail polish and get it all over your white carpeting right before you have to head out the door. You forgot to fill out some tedious paperwork that has to be turned in today. The fact is that life happens and no matter how much preparation we do in advance, there are just some things that can disrupt our ideal morning routine. A great way to combat this is to leave some extra time in your schedule to anticipate the unexpected happening. This way, you won’t be as stressed out and flustered when it inevitably does happen. Having one thing to look forward to in the morning makes it easier to get out of bed when you are still feeling groggy and also sets the tone for the rest of your day. It doesn’t have to be something super time consuming, but even the simple things you love count! For example, the introvert in me thrives off of alone time. It doesn’t happen as often as I would like these days, but I truly just love being alone from time-to-time and find it to be so centering. So my goal most mornings is to wake up at least 20-30 minutes before Little Miss so I can enjoy my breakfast and a cup of coffee in peace and quiet. It sounds so simple, but it’s something that sets a nice tone for the rest of my day since I started my day off doing something I love and filling my own tank before pouring my energy into my two-year-old the rest of the day. 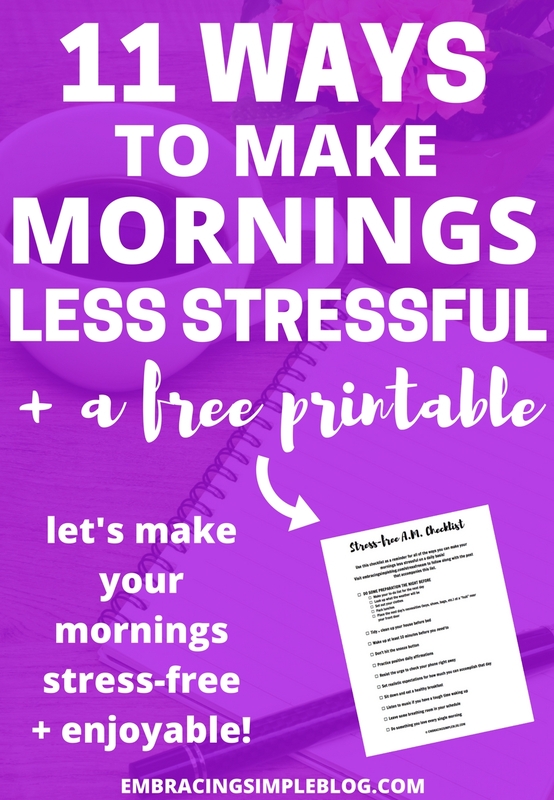 I hope that some of these strategies help you to make your mornings less stressful! 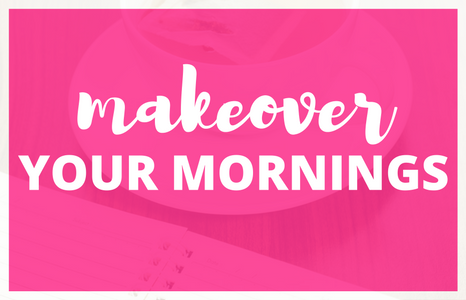 If you’re looking for more tips to completely revamp your mornings and create a morning routine that starts your day off on the right note, I highly suggest signing up for the Makeover Your Mornings course. 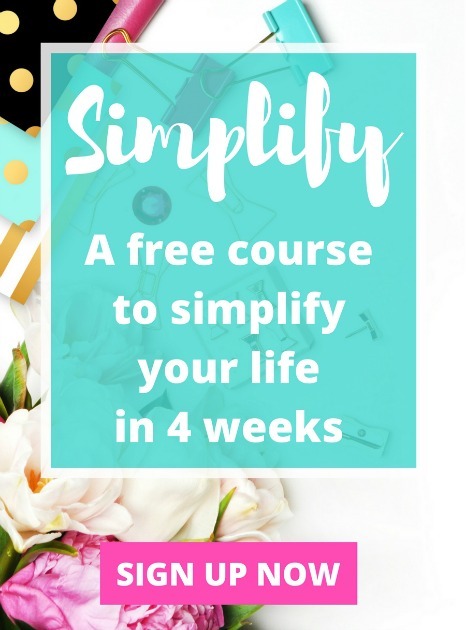 I personally overhauled my morning routine entirely just as a result of completing this course and feel a lot happier and more productive by doing so! Do you have any strategies that help you make your mornings less stressful? Let me know in the comments below! 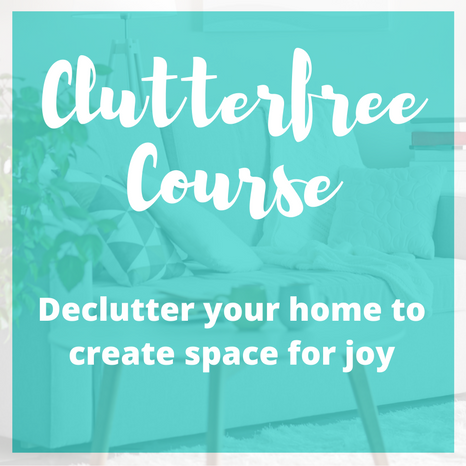 Don’t forget to grab your free printable! I also took Make Over Your Mornings and the course was great!! I always try to clean before bed and do as much prep as I can the night before. I haven’t used an alarm in years thanks to my little ones waking up super early 🙂 We’re all up about 1 1/2 – 2 hours before we need to leave for the day, so I never ever feel rushed. 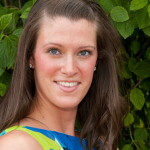 If there are any working moms reading this, I highly recommend doing the same! And if my kids do so happen to sleep later, I naturally wake at the same time each day and get to enjoy my coffee with my husband in peace. Mornings have become my favorite part of the day lately! Aw thanks Sarah! 🙂 Heck yes! And I’m going to keep that in mind when Little Miss starts preschool next month too, it’s always way less stressful getting out the door when you know you have plenty of time. Great post! I guess this counts as my do one thing that you love, but I always start my day with a 15 minute morning yoga youtube video. Nothing too challenging, just a great way to feel stretched and energized at the start of the day. Thanks Chela! I love it, that’s a fabulous way to start your day!! I wasn’t born a morning person, but I have to say implementing a few things on your list has saved my life to date. Thanks for the reminder and a couple more things to add to the morning routine. That’s great to hear Abbie, I’m so glad you found it to be helpful! Great list. I’ve always been a morning person… that is until I had a baby. Being a morning person and taking care of a two month old just don’t seem to mesh. I’ve often done many things on this list as a morning person, but haven’t had the chance too. Hopefully, I’ll be able to return to it once life with a baby turns to some kind of normalcy. Terri, I wouldn’t even worry about it. The first 3 months of having a new baby in the house are all about survival mode! Be easy on yourself, you need that extra sleep from waking up throughout the night! These are all great tips… I am the type of person that HAS to have breakfast, so I completely understand that. I really just need to be in a better mood in the morning. My plan is to listen to music, not check my phone (such a bad habit of mine! ), and try positive affirmations. That’s wonderful Sahvana, how’s it going for you?! What a perfectly timed post, Christine. I work from home and love to workout first thing in the morning. I usually get up around 7:30 and by the time I eat breakfast, get dressed hit the gym and come home it’s usually already 11:30… where did my day go???? I’ve been challenging myself to get out of the house within 30 minutes of getting up, and it’s totally changed my morning. I’m looking forward to implementing some of the tips you provided. Haha I can relate, the mornings seem to go by very quickly for me as well. It always feels like the time flies! I love your challenge idea, that’s awesome! I know when I follow a lot of these steps my mornings go a lot better! It always puts me in a much better mood in the morning to wake up to a tidy house! One thing I need to try and implement is getting up 10 minutes early – I’m always hitting the snooze button in the morning! Me too Laura! Waking up to a tidy house is always the best way to start my day! Great post, Christina! Such great ideas! I’m not a morning person whatsoever and I really need to improve at pretty much everything on this list. 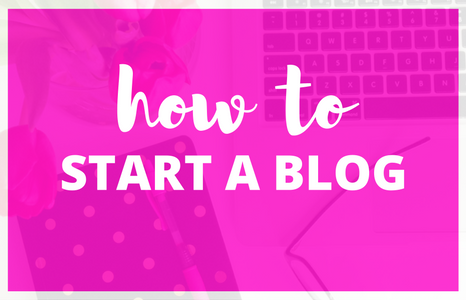 I used to snooze forever and these days I’m trying to get blog stuff done before I go to work, and I never leave enough breathing room! I’m pinning this to look back on. Thanks! I love the mornings and find that a good morning routine sets the tone for my whole day. I really appreciate your tips about preparedness the night before. Borrowing from the ayurvedic tradition, I find that looking into the sun in the morning is a great source of calm and energy. Also, lemon water is a great way to get the digestive system going. And, on the mornings that I write in my gratitude journal (usually during my morning commute), I’m in a better mindframe all day. I’m also another night owl who have trouble waking up in the right mode. I’ll end the night on a high with all brain muscle running. And yes, I’m guilty of hitting the snooze button too many time. I’ll try your advice. I think if it works for you, there’s a high chance that it will work for me too. Hi Kenny! Absolutely, if I can do it, anyone truly can! 🙂 Best of luck to you, please let me know how it goes!